A rendering of how the Gansevoort Street project will look from the High Line. MEATPACKING DISTRICT — A controversial project to redevelop Gansevoort Street is expected to draw crowds at an upcoming Community Board 2 meeting. Aurora Capital Associates is redeveloping the entire south side of Gansevoort Street from Ninth Avenue to Washington Street. BKSK Architects presented renderings of their designs for five buildings of varying heights at a small, informal neighborhood meeting in August. 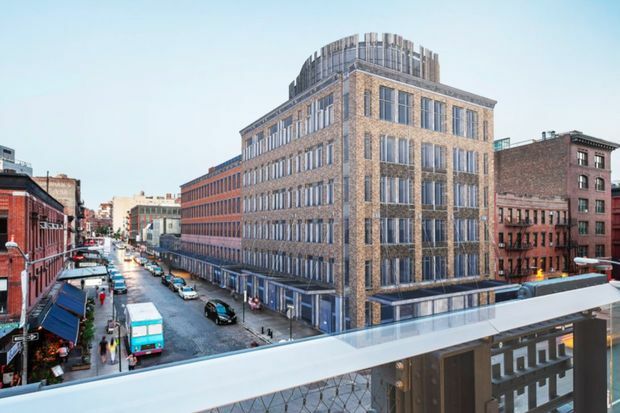 Because the block lies just inside the protected Gansevoort Market Historic District, the project's design must get the approval of the Landmarks Preservation Commission. Locals have organized against the project, disseminating a petition urging the LPC to reject it, and the Greenwich Village Society for Historic Preservation sent an email blast to their supporters encouraging them to write in or show up to the Oct. 15 CB 2 landmarks committee meeting to oppose the project. "While growth and change can and should be allowed in our historic districts, this plan would fundamentally alter the character of this landmarked block which serves as a gateway to the Meatpacking District, the West Village, the High Line, the Whitney Museum, and the Hudson River Park," GVSHP wrote in their email. The two tallest buildings in the BKSK plan, which sit on the Washington Street end of the block, drew consternation from the audience at the August meeting, particularly angering a small number of residents of Horatio Street, whose buildings are back-to-back with the proposed new construction. ► CLICK HERE FOR DNAINFO'S COVERAGE OF THE AUGUST MEETING. The architects' efforts to make their design contextual include the use of brick, wood and steel was intended to recall the rail line that used to run along Ninth Avenue, the restoration or recreation of historic marquees characteristic to the neighborhood, and the unique design of the top two setback floors of the tallest building. That "penthouse" is curved and wrapped in wood over panes of windows, meant to recall the iconic water towers all over New York City. Other plans for the buildings include glass-and-steel storefronts for all five buildings and excavation to create cellars under the three buildings that are not being demolished. Of those three buildings, 46-48 Gansevoort St. and the Gansevoort Market building at 52-58 Gansevoort St. will remain largely unchanged, and 60-68 Gansevoort St. will get an additional three floors. BKSK is referring to this addition as a “reconstruction of the historic building,” because the tenement building at that address before the 1930s was taller. The remaining two buildings will be completely demolished. 50 Gansevoort St. would be replaced by a new three-story brick building with steel windows, and 70-74 Gansevoort St., on the corner of Washington, will be replaced by six stories would be “mottled gray” brick, topped by the set-back two-story wood-and-glass “penthouse." A project spokesman said the plan that will be presented at the Oct. 15 meeting has changed very little from the renderings presented in August and posted to the development's website. The Community Board 2 meeting will be held Thursday, Oct. 15 at 6:30 p.m. at P.S. 3 o 490 Hudson St.